In 2010, Monica H Carlsen et al published a study titled ‘The total antioxidant content of more than 3100 foods, beverages, spieces, herbs, and supplements used worldwide‘, which serves as an excellent starting point to understanding which foods to encourage, or which ingredients may be best to incorporate into foods, to provide antioxidants. 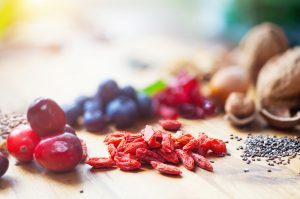 Plant sources like berries, fruits, nuts, and vegetables topped the list, with spices and herbs being especially high in antioxidants by weight. These foods are a cornerstone of dietary recommendations worldwide, and are often under-consumed. It’s important to note that not all antioxidants are equal, and antioxidant content of foods doesn’t directly translate into health benefits. However, this list is a great place to begin and offers useful information to product developers. Read more about the role of antioxidants in health on the International Food Information Council website.